With just over 5 weeks to go until the Virgin London Marathon, I thought it would be a good idea to post a few updates about how my training is progressing. 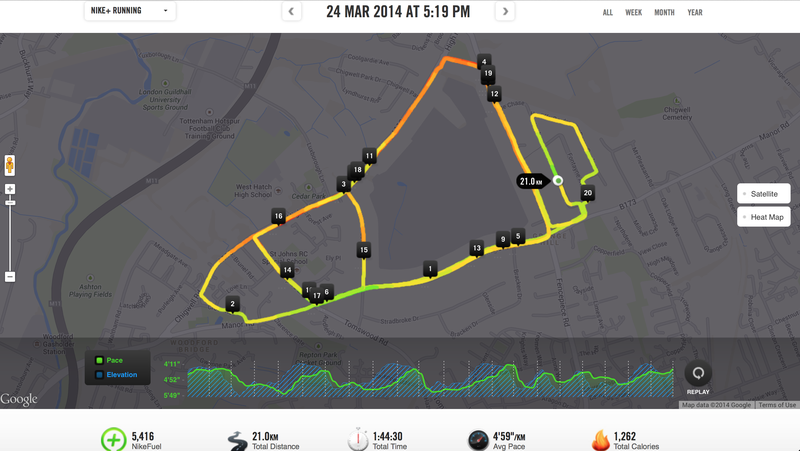 So last Sunday I decided to do an easy 21km/13.1 mile run (a half-marathon). This was a nice long run which I actually quite enjoyed, with plenty of energy left at the end! I next ran two days later, managing to achieve a personal best of 46:36 for the 10k. I should mention that I am also running the Bupa 10k in May, and aiming for a sub-45 there. I went for a mid-week run of 15km, keeping to a steady pace of just over 12km/h. This seems to be my ‘comfort zone’, but no doubt may have to bring this slightly down during the 42km marathon! Going for a long weekend run seems to be the suitable plan of action, in no small part because weekdays are usually very busy. I went for a 25km run, keeping a relatively steady pace throughout, managing just under 2 hours and 11 minutes. The run was a little strenuous, which may have been down to the hot weather, which really is nothing to moan about! I feel that recovery is going well. Within 24-36 hours, my legs felt absolutely fine after the previous 25km run. With the sun out, I went for a very comfortable 10k, taking longer strides and focussing on more of a hilly route. So here are a few more runs from my training log in the weeks leading up to the marathon, including a personal best bald-marathon (21km) time of 1:44:29! I will keep this post updated with most of my training runs leading up to the marathon!